About - TAPESOUTH - Gainesville, Fl. From our headquarters in Gainesville Florida, TAPESOUTH serves customers nationally and internationally with a complete range of special use and general purpose adhesive tapes and labels. TAPESOUTH has highly sophisticated manufacturing, converting and printing equipment to meet the specifications required for your application. Engineered and quality controlled to assure dependable performance, all products are available in a wide range of tensile strengths, adhesive levels, lengths, widths, colors and other specifications to meet customer requirements. Repeat customers include many Fortune 500 companies in the aerospace, electronics, communications and paper industries, as well as military and government agencies. 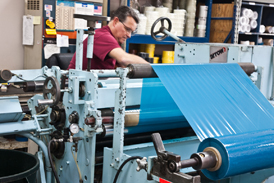 Excellent service is provided because of TAPESOUTH’s large inventory and unique converting capabilities. TAPESOUTH welcomes your inquiry and looks forward to the opportunity to serve you.